Home Slice is our holiday promotion winner for 12/13! Please contact us via Facebook message or email: promotions@rider.com with your full name, address and contact info. Scott Truglio is our holiday promotion winner for 12/12! Please contact us via Facebook message or email: promotions@rider.com with your full name, address and contact info. RM Jacob is our holiday promotion winner for 12/11! Please contact us via Facebook message or email: promotions@rider.com with your full name, address and contact info. Swap a motorcycle gift idea for a chance to win a $25 gift card! Starting Black Friday (11/23), for every motorcycle gift idea you post on the Rider Facebook or Twitter page through Friday, 12/21, Rider will enter you in for a chance to win a $25 gift card daily drawing with no one person winning twice! Share our post and get a bonus entry! 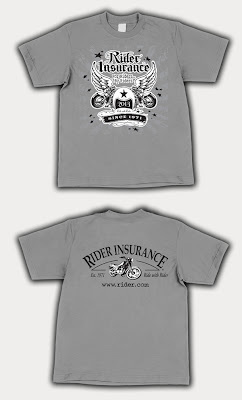 The daily winner and updated motorcycle gift ideas list will be posted on the Rider Blog starting 11/26. Weekend winners will post the following Monday. Check back daily to see if you’ve won and get some great ideas for gifts for the special motorcyclist in your life! Congratulations to Lonnie W., he is our 2013 T-Shirt Design Contest winner! Here is his winning design. Thank you to everyone who participated in the contest as well as all of the people that voted for the designs. Joe Perez is our holiday promotion winner for 12/10! Please contact us via Facebook message or email: promotions@rider.com with your full name, address and contact info.